I've just added another batch of prints to the Affordable Art section of the shop. When I bought my new press, I did dozens of quick studies in monotype exploring various palettes and ways of mark making. I'm now offering a selection here for sale each at teh bargain price of only £20.00. 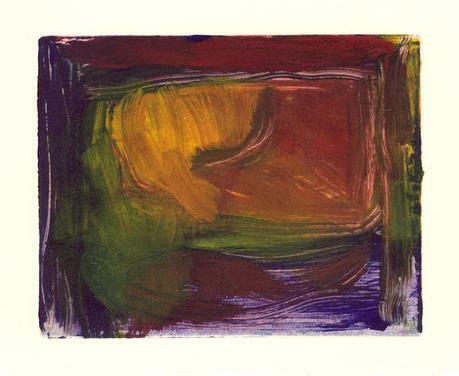 Each print is about 5" by 4" (145mm by 100mm) on Somerset 300gsm printmaking paper. The actual paper size will vary, but the margins are large enough for a mount. Because these are just studies, there may be some ink marks on the surround but the images are all clean. Each print is initialled on the face and signed on the back. I will also include an adhesive label for you to fasten to the back of any frame with brief explanatory text. Go and have a look - you know you want to buy one!